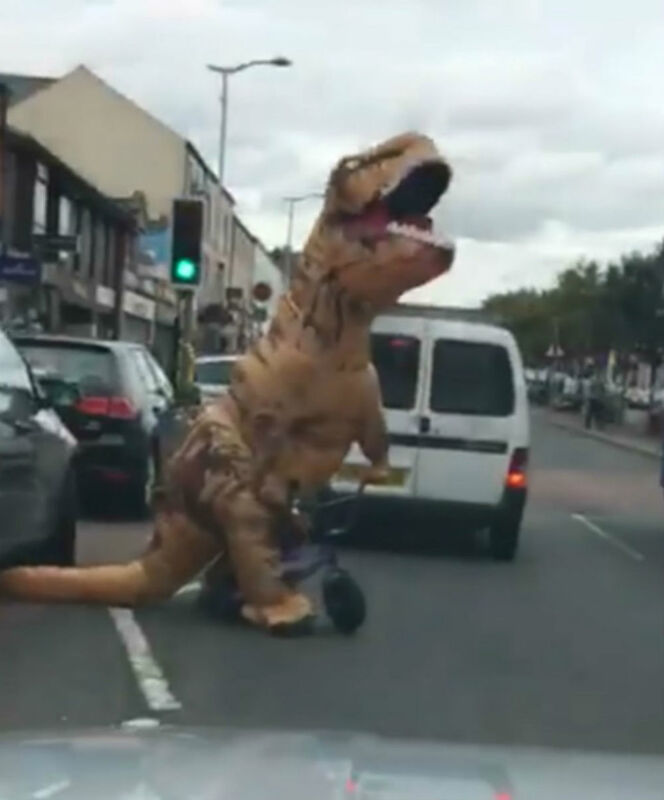 A BIZARRE clip shows a T-Rex cycling through the centre of a busy town. 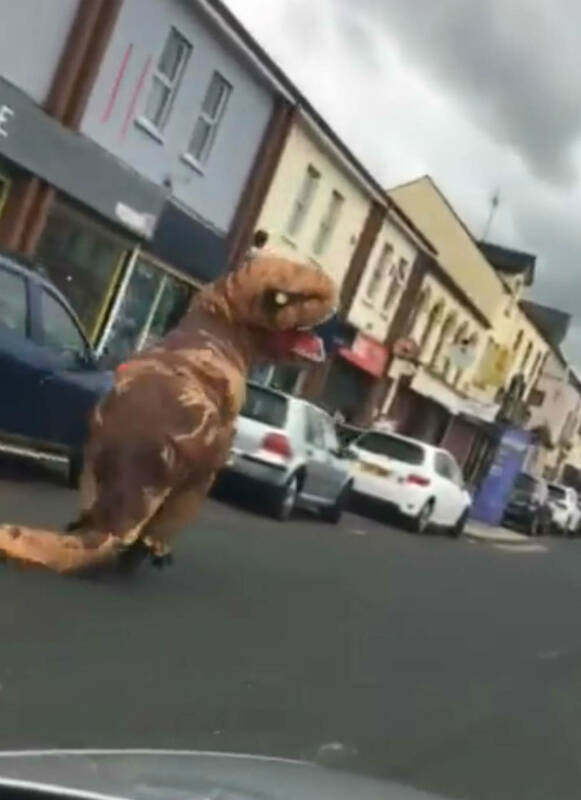 Tommy Wilson was filmed wearing the prehistoric costume as he peddled through the streets of Banbridge in County Down, Northern Ireland on Saturday. The clip, filmed by one of Tommy’s friends, shows the window tinter cycling on a tiny £60 bike he had just bought – while his dinosaur tail shakes around behind. Hilariously, the costumes gigantic claws are shown hopping back onto the peddles after waiting at a set of traffic lights before the T-Rex’s huge rear end is shown shimmying from side-to-side. 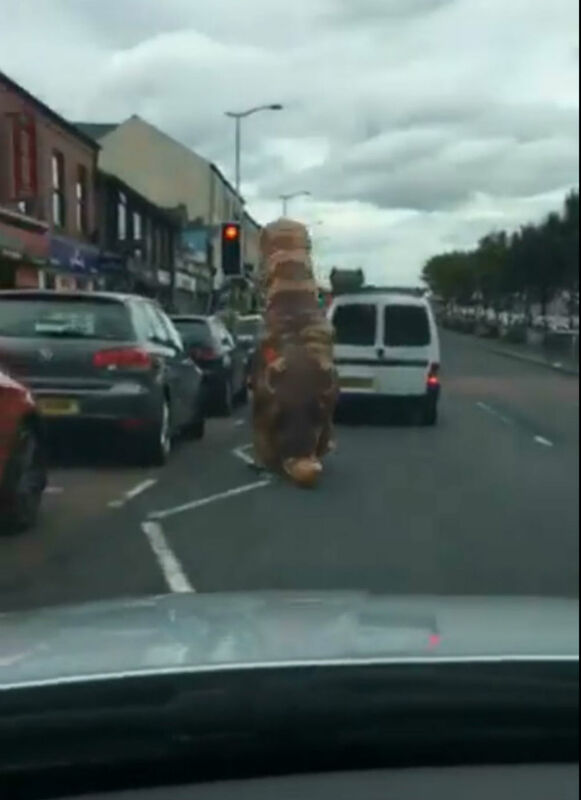 The seven-foot tall blow up creature continues to cycle around behind a stream of traffic whilst onlookers can be heard laughing in the background. At one point, Tommy loses his balance as the bike can be seen wobbling to one side. But he quickly picks up the pace again and continues on with his prehistoric adventure before coming to a halt at a roundabout. Before the clip ends, the dinosaur’s little arms can be seen waving around as it shows off its inflatable white gnashers. Tommy posted the clip onto Facebook on Saturday, captioned “spotted today”. The clip has since attracted over 432,000 views and hundreds of comments from humoured viewers. Speaking today, Tommy said: “I bought the suit from eBay for £40 and the bike for £60 from a local buy and sell page.